For the first time in history (as far as I know) there is an alternative for lost or damaged C5 ULA chips. 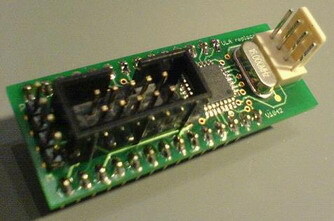 This module replaces the original ULA chip in the POD of the Sinclair C5 and provides some additional features. I started this as a tiny hobbyist project - not much more than a proof of concept - but during the last months it turned into a huge project, including a small batch series of modules. I've wrote an extensive project documentation here which will answer all your questions. The replacement module will be inserted in the IC socket in place of the original ULA chip. Inside the control box (below the seat) you need to add an additional resistor, remove another one and cut a cable which comes from the POD and can now be used to control a fan. And that's all. My project documentation will show you how to install the replacement module in detail. The replacement module enables you to convert the C5 easily into a pedelec bicycle which allows you to drive it without insurance or any accreditation within the entire EU. The software for the microcontroller of the replacement module can be upgraded via a bootloader program. This makes sure everyone will be able to upgrade to new firmware with less effort and without any programming knowledge. There is so much to tell about but maybe the best would be if you just read the project documentation. During the next days I will be in holidays. When I'm back I will start a new topic in the marketplace here to sell these modules. The only thing I can tell so far is that the price will be about 40 EUR (circa £ 34.00) for an assembled and programmed module including accessories. Until then I'm looking forward your comments. PS: Maybe there are still some spelling errors in my documentation. This project literally finished "last-minute" and I'm really glad to do something completely different and forget about the ULA chip for the next days. Phil as a fellow newbie may I say just one word. Well done - I also suggest you have become 'Sinclair C5 god status'!!!! Looking forward to seeing those up for sale in the market place section, it should help keep a few more c5's on the road in their original format. Outstanding - top man - lost for words - you are elevated to C5 GOD status !!!!!!!! That is some project and the documentation is just fantastic. You certainly deserve a rest ! I would like one of these when available. That's fantastic! I'm actually rather glad that I didn't get my replacement finished now, it wouldn't be nearly as good. I can't wait to get one of these and have a play! @aladds: So you also made a replacement? It would be interesting to see you approach! You are really a wizard, Phil ... many many compliments for this exciting goal !!! I hope it may be useful. Hi Phil - I need at least 3 of these replacements possibly a fair few more - are there plans for another batch ? I upgraded from a bugatti to a c5. No joke!